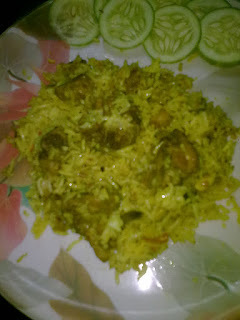 Chicken biryani - The name biryani is derived from the Persian word 'berya' which means fried or roasted.The name 'dum' has come from the word 'cooking in steam'-that is how the name Hyderabadi Dum Biryani. salt,green chillies slit (3-4),haldi powder,curd,ginger garlic paste. In a kadhai add 1 tpsn oil and 1 tbspn ghee. Cut the medium sized onion lengthwise(vertical). Fry it in the oil till it turns brown. Keep it aside once done. Now add 2 tbspn oil to the pan. Add the big onion finely chopped to this.Then add ginger garlic paste and salt. Now add the tomato finely chopped and then coriander powder(1 tpsn) and cumin powder (1 tpsn).Close the lid and let this cook. Open the lid of the pan and see that the mixture is well cooked.Now add the marinated chicken to this and close it again for around 10 min. To make the biryani masala - make a fine powder of 4 cardamoms,3 cloves,4-5 pepper corns,2 sticks cinnamon. Add the biryani masala to the chicken and again close and cook for another 10 min. Dip the saffron strands in luke warm milk. Now add the rice to the above chicken layer. Add ghee,few fried onions and some saffron(soaked in milk). 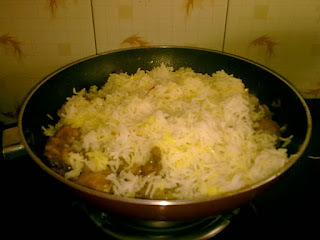 Again add the remaining rice layer and ghee,fried onions and saffron(soaked).